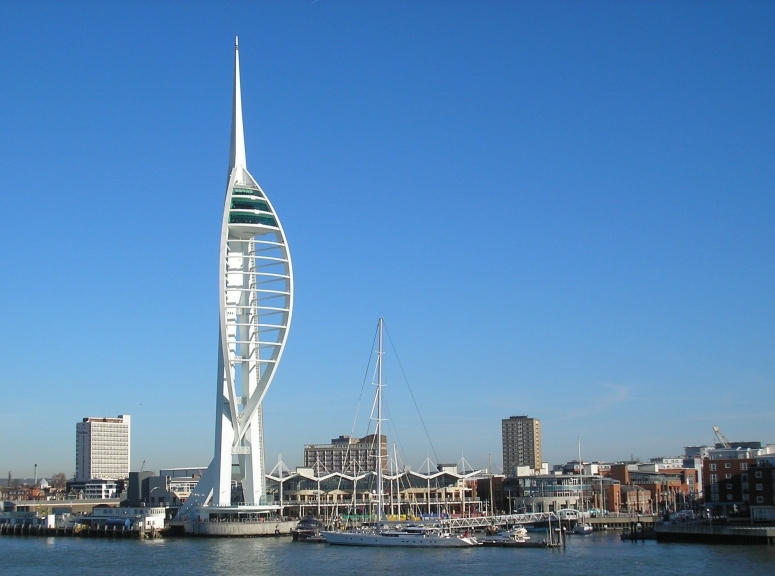 The Spinnaker Tower is a �35million, UK Millennium Commission sponsored project aimed at transforming the waterfront of Portsmouth and Gosport. It forms the focal point of a �200M regeneration of the Portsmouth Harbour area and adds a new international landmark to the South Coast of Britain. Designed by Scott Wilson Advanced Technology group (now part of URS), LUSAS Civil & Structural analysis software was used by its London office for an independent Category III check of the original design for the client Portsmouth City Council. Spinnaker Tower is a concrete, steel and composite structure that rises 170m from the sea adjacent to Gunwharf Quays. It has three tourist viewing platforms at heights of 100, 105 and 110m that offer extensive views over Portsmouth harbour and beyond. 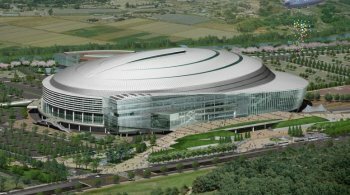 It is constructed upon a 3m thick pile cap and founded on 84 piles, and comprises two inclined slip-formed hexagonal concrete shafts, of 6m across, which merge into a single shaft at 70m. One shaft contains an internal express lift and the other shaft carries a panoramic external lift up the seaward face. Two elegant crossed bows, fabricated from 10.8m long and 1.5m wide structural steel box sections, rise from the ground, cross between the shafts at 35m and rise to connect with the shaft at 120m. The bow dimensions vary from 10-12m in depth at the base and top of the tower, reducing to 2.5m wide in the central region. Aerofoil shaped ribs span between the bows to give the distinctive �Spinnaker� sail appearance. A composite spire forms the needle-like top to the concrete A-frame. 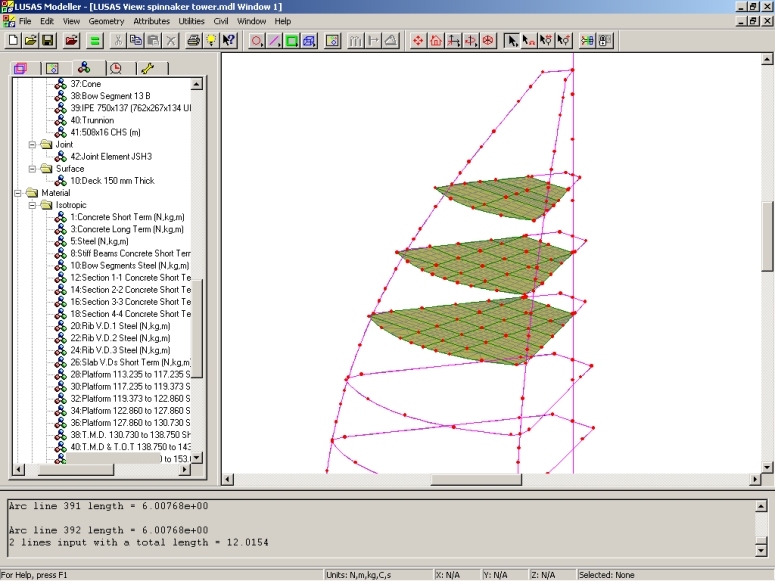 Static, nonlinear and dynamic analysis were all employed by Scott Wilson to analyse the model of the Spinnaker Tower in LUSAS. Ship impact, wind dynamics, wind-induced fatigue and the consideration of human perception of wind-induced movements at observation deck level all needed to be assessed in the design check. To do this, a model of thick beam and thick shell elements was created and used as a basis for the three distinct analyses that were carried out. In doing this the arbitrary section property calculator built into LUSAS was particularly helpful in deriving the section properties required for the varying cross sections of the concrete towers and of the steel bows, and helped to speed-up the building of the model significantly. Load cases analysed included self-weight, dead loads, live loads, wind loads and various temperature differentials. Building services loads were generally applied as uniformly distributed loads, with major equipment applied as point loads. Wind tunnel testing provided the wind forces to apply to the model. Differential temperature loadings requiring detailed investigation included variations with respect to the assumed erection temperature, differing temperatures of each leg and for opposing faces of each leg, as well as differing internal and external temperatures for the mast and for the viewing areas. Long term creep and shrinkage was also investigated. 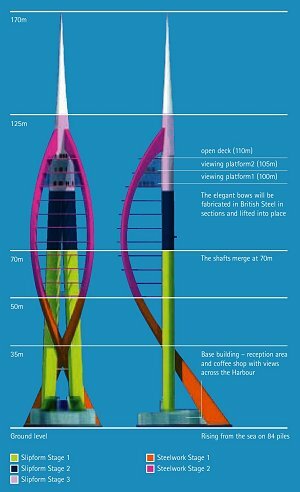 Mokhtar El-Houry, Assistant Structural Engineer at Scott Wilson�s London office said: "Spinnaker Tower is quite unique in its design and required the use of finite element tools to accurately model its behaviour. The original tower design was carried out by the Scott Wilson Advanced Technology team based in our Basingstoke office - our involvement in the London office was as Category III checkers. We essentially redesigned and remodelled the tower independent of the Basingstoke office, and in using LUSAS to do this further reinforced our position as independent assessors." The tower provides three high-level trapezoidal viewing platforms that vary in size from 18m x 14m down to 12m x 4.7m for the highest open deck. A grid of I-section steel beams span between the concrete tower, steel bows and frontal rib beams at each level to support the 150mm thick concrete floor slabs. Each platform was designed as a composite deck with vertical vibration from crowd loading considered as part of the design check. From the results of the various LUSAS analyses it was shown that, despite its uniqueness and the use of different construction materials, the tower essentially behaves as a static/simple structure - results from the nonlinear models matched very closely the results from the slightly less well defined static model. Khaled Majdoub, Assistant Structural Engineer in London office said: "Being able to check the structure for nonlinear responses was invaluable especially when dealing with a structure that has never been designed before. We also found being able to model the dynamic response very useful." In recognition of the importance of correct modelling of these types of unique structures Mokhtar El-Houry added: "We found the technical support provided by LUSAS on this project invaluable. 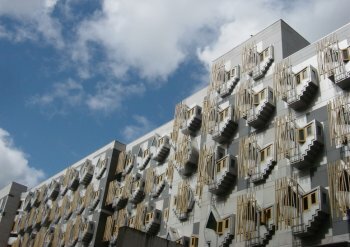 The support team were quick and eager to help and furnished us with sound advice when approached." 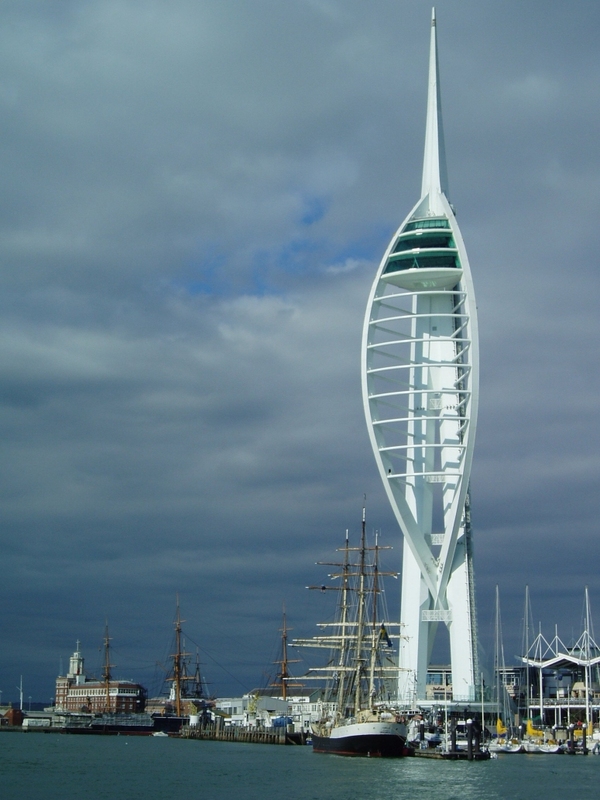 Now complete, the Spinnaker Tower is the tallest public viewing tower in the UK. It has a design life of 80 years and attracts more than half a million visitors annually. The build cost of the project was shared between three main financial contributors: the Millennium Commission, Portsmouth City Council, and the Berkeley Festival Waterfront Company Ltd.
"We found the technical support provided by LUSAS on this project invaluable. The support team were quick and eager to help and furnished us with sound advice when approached." Any modelling and analysis capabilities described on this page are dependent upon the LUSAS software product and version in use. Last modified: April 23, 2018.